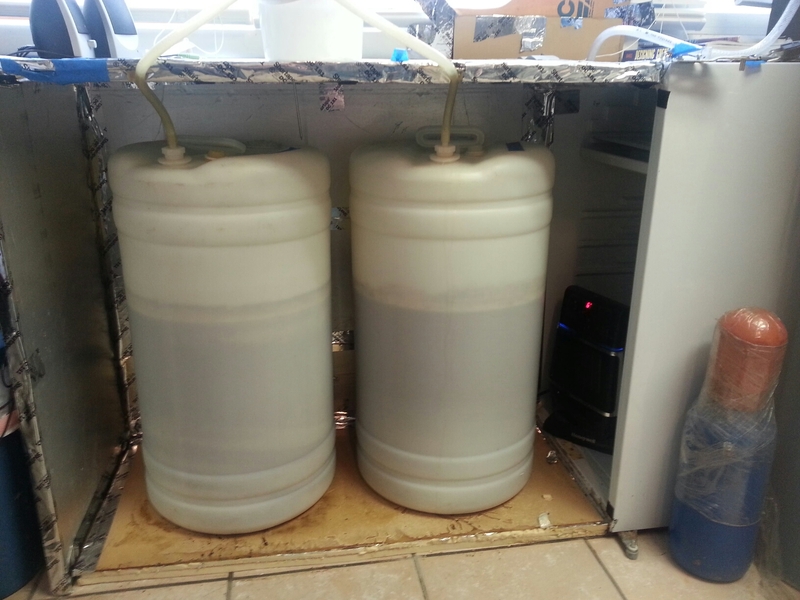 I built my own fermentation chamber as my wife probably wouldn’t appreciate the beers fermenting in our living room – which offers excellent temperature control for ales I might add. I put this in the ‘Florida room’ with all the other beer stuff. The room itself can get down to 30 degrees in the winter and 80 degrees in the summer – so I had to plan for those temperature extremes. The chamber consists of a 33″ tall freezer/refrigerator (like the ones at hotels) with the door off. The silver walls are 1 layer of 1/2″ foam insulation. On the inside is a small digital ceramic heater that will automatically control temperature. 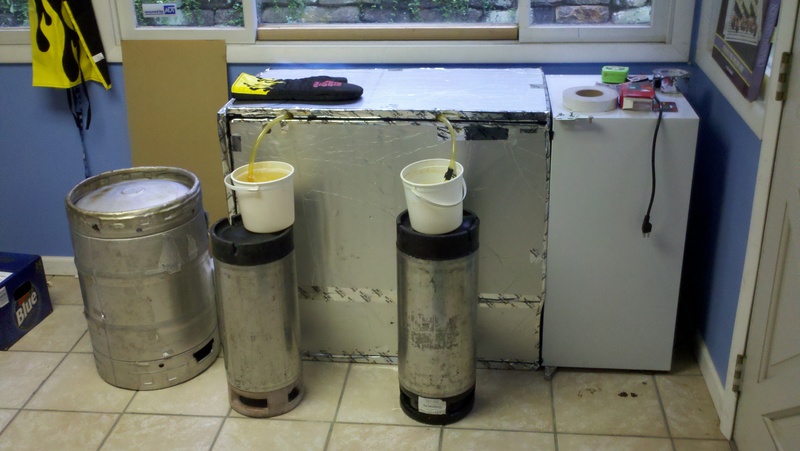 It is important to have a layer of insulation on the floor and a thin piece of plexiglass that the fermentors sit on – so as not to dent and crush the insulation. Plus in the winter, the floor gets real cold and can chill the fermentors too cold if you are still trying to ferment. I usually have the ceramic heater set to 65 degrees. Sure, when it’s on (only about 2 minutes) it will shoot up to 80 degrees, but the chamber will start equilibrating immediately to where the majority of the time will be in the high 60’s when it’s not on. This is a little more difficult but doable. 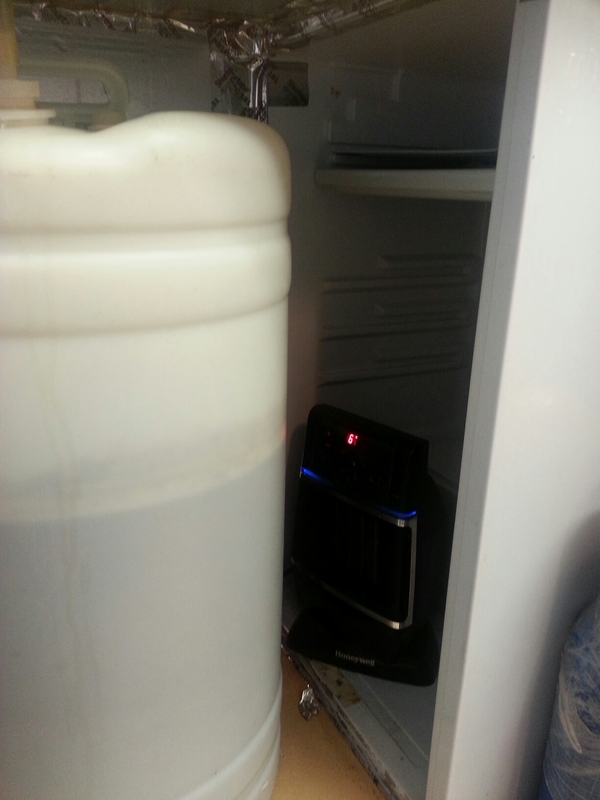 I have a temperature controller with thermocouple in the chamber and the freezer plugged into it. Once it gets above 70, the freezer/refrigerator will turn on. Usually I don’t have the heater and freezer in use at the same time as they will tend to fight each other for control. *For a chamber of this size, in the warm months even with the freezer on fulltime, the temperature will not get below 50 degrees. You can certainly lager in this chamber as it will get down to the 50’s assuming the room isn’t over 70 degrees. I usually notice a 20 degree differential between the outside room temp and the lowest fermentation chamber temperature when the freezer/refrigerator is plugged in full time. So if the room reaches 90 degrees on a hot summer day, the chamber will be around 70.